If you’re going to have a farm, then make it a good one. If you’re going to make it a good farm, then why not go all the way and make it Heaven Farm. This was our first post-refurbishment trip and we wanted it to be one we would remember. Research Sarah took over and found a campsite not too far away and more importantly, for us at least, a campsite not too busy. We wanted a quiet weekend. What we found wasn’t your average campsite. It was better than that. Welcome to Heaven Farm. 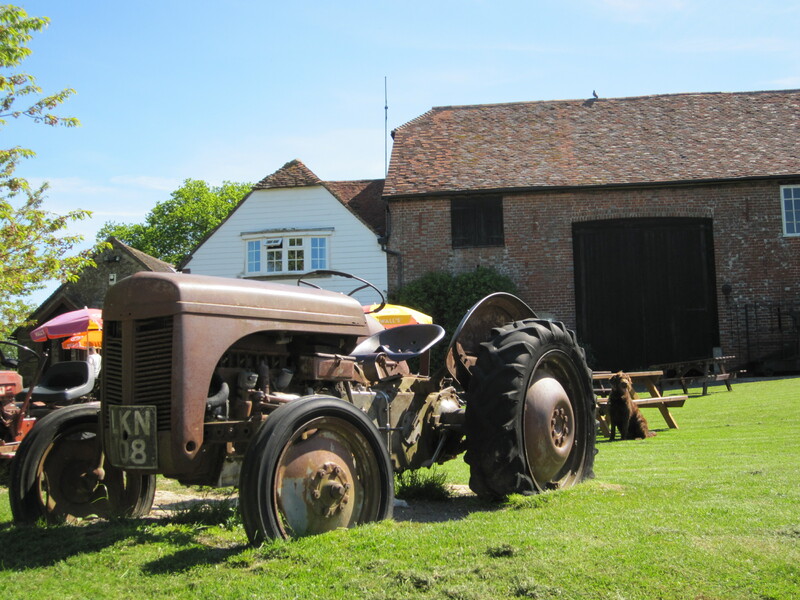 First Impressions – An age-old Farmhouse, barns and ancillary buildings and some tractors. Chickens freely roaming with the ducks and turkeys, the sky filled with white doves sweeping in great circles between the farm buildings and their dovecot across the way, kangaroos and wallabies hopping around their little enclosure (I jest not), a small paddock for the oldies in the caravanning club which was full of big white motorhomes that look like they’re wearing Smurf hats, and beyond that the meadow where we were booked. Yes, in a meadow. Not a field, but a meadow. I originally wrote it and then Sarah did some much needed editing so would-be readers could understand it and not be put off. We arrived Friday late afternoon – about a 90 minute ‘after work’ drive down the road. There was enough of the afternoon and evening left to get sorted, cook dinner, sink a few glasses and reflect on life living in a field, sorry… meadow. The afternoon had been sunny with fluffy clouds high in the sky and the evening was turning into a lovely sunset. What more could one ask for.? Well one could ask for some instructions for the awning – that would have been useful. I’d have swapped the sunset for some instructions. I’d have swapped the meadow for some instructions. To be honest, I would have swapped Sarah for some instructions – which could be described as a like for like deal, given that Sarah is sometimes likened to a continuous set of instructions – being female and all that. I jest. The awning was simple. I had it erected in about 2 minutes and nailed to the ground in another couple of minutes. Its self-styled strap line is “Quick Erect System” and it is. We were really pleased with it. If only it came with the correct fitments that connected it to the bus. Never mind. I am sure we could live with the one foot gap between the bus sliding door and the awning. Besides, we were in a meadow of privacy and no rain was forecast. When camping, what better meal to eat than bangers on the barby. It’s a cliché and perhaps it’s not really that true. In fact it might just be a bit of a cop-out to cook bangers rather than rustle up some wild camping food. But then our bangers were the mighty Godalming Sausage. Sarah is a wonderful cook and campsite meals these days are indeed fine cuisine. Talking of which – should you ever need some campsite cooking inspiration then check out www.guyropegourmet.com for some great ideas – a creation of “nanthevan”. One good plug deserves another. What a great feeling to be finally doing it and doing it in a truly marvellous setting with our fully refurbished no-name bus. And do you know what, we didn’t need that portaloo. 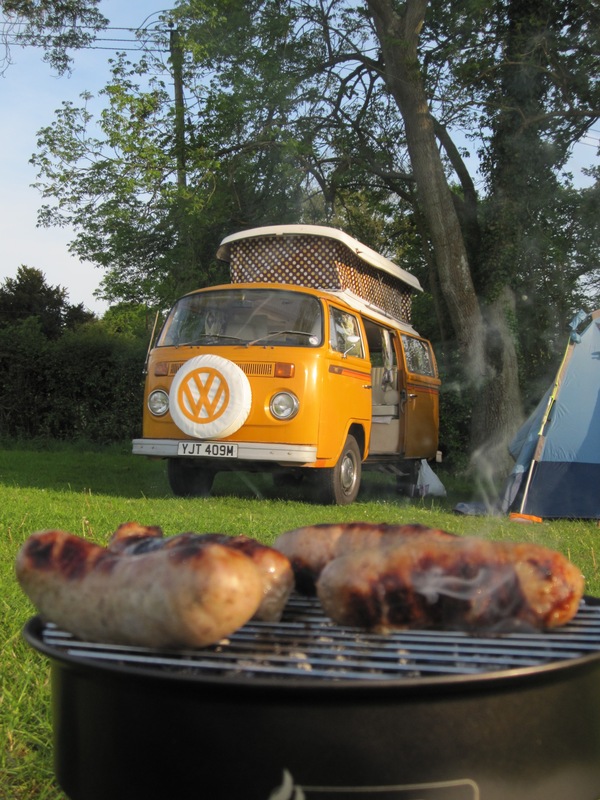 Bring on the 2010 summer of campervanning ! The “Godalming Sausage” is sourced from our local high street butcher. Obviously they are made from a secret recipe, but I believe the ingredients include black pepper and sage giving them a kind of sweet but ever so slightly peppery kick. Not to be confused with the Farncombe sausage from the next town on which isn’t nearly as nice in my humble opinion. There’s only one bloke we know, Dodge from Dodge City aka Shalford-London-England, who buys his sausages from Farncombe. Watch out for the Dodger who tries to sneak his sausages into your BBQ. This entry was posted in The SapaBus Blog and tagged happycampervanning, Heaven Farm, VW Campervan. ← BLOG 26 – WHERE ARE WE AGAIN?